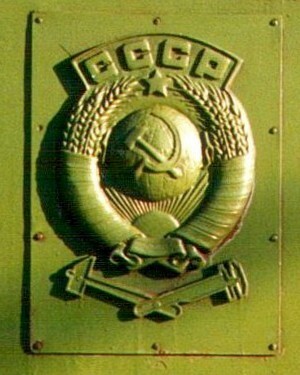 Metal plaque on a Russian train. 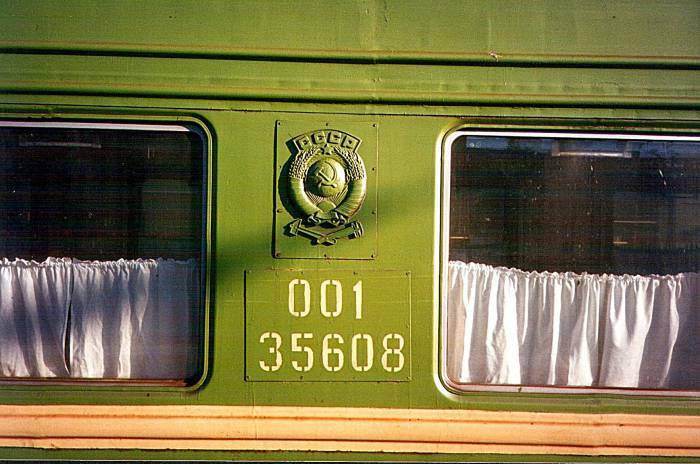 I went to Russia the first time by taking the train from Warsaw to Moscow. I then flew home from Sankt-Peterburg. I flew into Sankt-Peterburg on the second trip, and then left by train to Tallinn, Estonia. After a few days in Estonia it was a ferry to Helsinki and a flight home. After that, I always flew between Chicago and Helsinki, and went in and out of Russia by train. 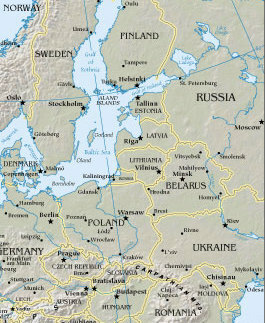 Usually by ferry between Helsinki and Tallinn, and train between Tallinn and Sankt-Peterburg. It takes a while to swap out all the old decorations on the rail cars. СССР is SSSR written in the Cyrillic alphabet. The name of the country was Союз Советских Социалистических Республик , which English-speaking users of the Latin alphabet render something like Soyuz Sovetskikh Sotsialisticheskikh Respublik. 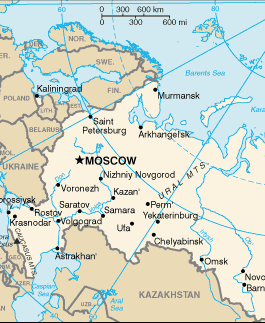 Translated into English, the name means Union of Soviet Socialist Republics, abbreviated as USSR. You board a train at Warszawa Centralna station in the late afternoon. By midnight you have reached the Belarussian border. The train is rolled into a large building. Large hydraulic lifts raise each car, so the western bogies (the two-axle wheel sets) can be rolled out and the Russian ones rolled in. When rails were being laid all around the world in the 1800s, the Russian Empire chose a larger gauge than most of the world. 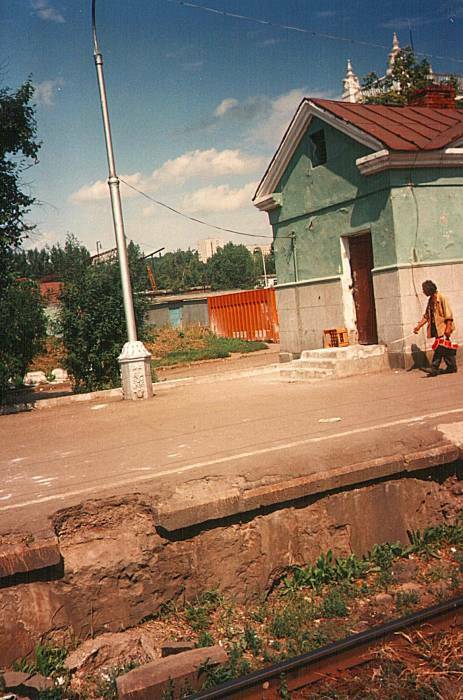 That is, the rails are further apart on a Russian railroad. Besides the potential for a smoother and more stable ride (well, at least in theory, if the rails are laid well), the incompatability makes land invasion that much harder. The alternative is wading through hundreds and hundreds of kilometers of swampy birch forest. Only the truly insane — Napoleon, Germany — attempt to march on Moscow. The border guards come through the train, then the cars are uncoupled and lifted so the wheel sets can be swapped out. Time for bed. You are rolling through Belarussia the next morning, with a stop in Minsk along the way. 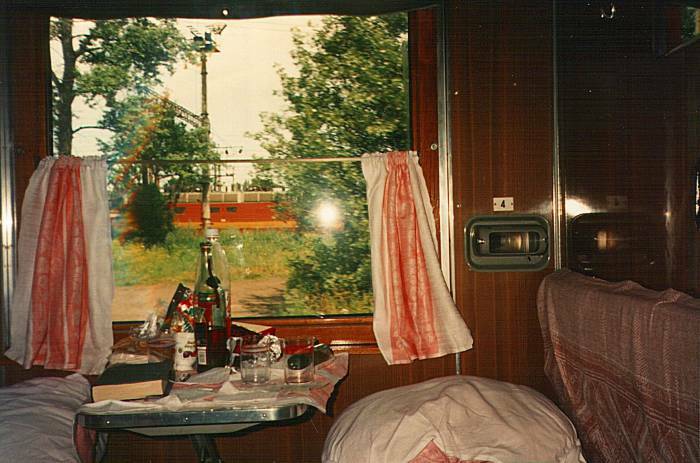 Rolling through Mother Russia in a sleeper car. The trains have nice accommodation — 4-bunk sleeper compartments, although only some of the bunks may be occupied. There was only one other person in my compartment, which was a good thing. He was a "shuttle trader", taking Russian goods to Warsaw to sell in the street markets, and bringing back loads of western goods for sale in Moscow. The upper bunks and storage areas were completely filled with all sorts of merchandise. Bring food and drink, and watch the birch forests roll past. You reach Moscow in the evening, over 24 hours after leaving Warsaw. There are two trains a day from Helsinki to Sankt-Peterburg. However, the one leaving later in the day arrives at Sankt-Peterburg's Finlandskaya Stantsiya late in the evening — very close to the time that the Metro shuts down. So, it is a far better idea to take the early morning train out of Helsinki. You have to be at the station awfully early, but you get into Sankt-Peterburg around mid-day. One of the Russian passenger cars. 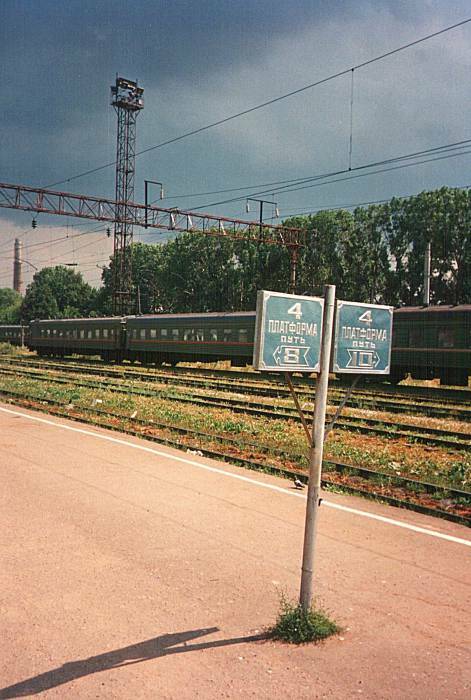 There is train service between Sankt-Peterburg and both Tallinn, Estonia and Riga, Latvia. The problem with the Riga train is that it crosses a corner of Estonia, see the maps above. One border crossing in the middle of the night is more than enough, two are at least twice as bad. The Tallinn—Sankt-Peterburg train leaves in the evening and crosses the border in the middle of the night, getting in at the other end very early in the morning (arriving in Tallinn) or mid-morning (arriving in Sankt-Peterburg). 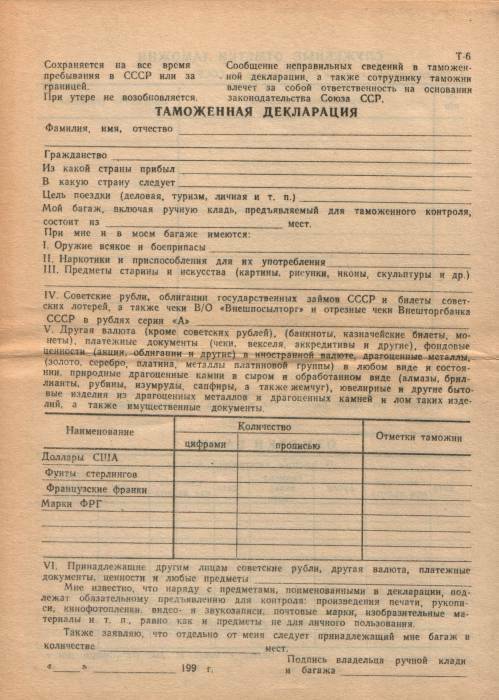 This is a rather old customs declaration, the Таможенная Декларация or Tamozhennaya Deklaratsiya. 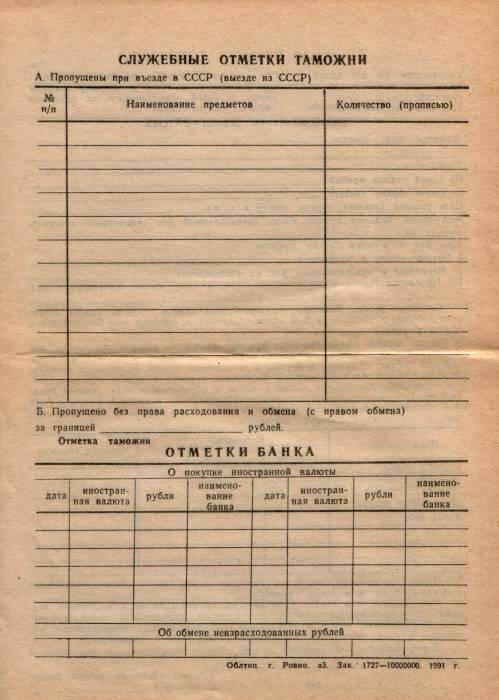 Although this form explicitly says it's for the Soviet Union, Russia kept using the old forms through much of the 1990s.